Ignore it, explore it, either way, it’s heartache. Ghazal: a lyric poem in couplets with a repeated rhyme. Typically a description of the beloved’s beauty, a lament of the poet’s separation from the beloved, or a description of a natural scene. Reviewers often position Mimi Khalvati as a ‘Persian poet’ due to her inclusion of Persian imagery, form, and the occasional line of Farsi in her poetry. Often, she makes use of the ghazal form, which is known as ‘the most important Persian lyric’. Through her collections, the ghazal appears in various guises, such as in her poem ‘Ghazal’ or in The Weather Wheel (2014), which consists of poems structured in ghazal-like couplets. What were the thoughts that lay too deep for tears? Oh, monkey-child, it’s time to lay them open. thrown, thrown like a rope from a very old pier to hold me. like a curing-song in the creel of my ear to hold me. ‘Ghazal: It’s Heartache’ offers a similar opportunity with its repetition of ‘heartache’. Indeed, specific rules of the ghazal structure unlock intense emotion: for example the repetition of words at the beginning and end of the couplets. Such drumming repetition creates a sense of desperation. Furthermore, the way in which a ghazal consists of autonomous couplets means that one emotion is layered upon by each couplet conveying the same message in different guises to reinforce such fervour. The ghazal’s repetitive and focused form also enables it to showcase the importance of small details for Khalvati. In this way, the poet is able to linger on the image of the Lily of the Valley or the candles of the chestnut trees in two separate ghazals. Her preoccupation with small things reveals how important small fragments and details are in her memory of her childhood. Indeed, her memory is a driving force of the poem. The ghazal has circulated in English literature for centuries: Tennyson and Hardy wrote ghazals, as did American poets like James Harrison, Adrienne Rich, Robert Merzy, and Galway Kinnell. Like these poets writing in English, Khalvati makes use of the ghazal, most importantly, for its formal possibilities. Undeniably, her interest in the ghazal cannot be separated from her Persian background, but by her showcasing of the possibilities of the ghazal form in English, Mimi Khalvati can be seen as a British poet making use of what is now a widely circulated poetic form in English. Examining the ghazal in Khalvati’s work in this way highlights how the labels placed on non-white or UK-born British writers are so often limiting, leading to the overlooking of direct poetic analysis in favour of an overzealous search for an ethnic and national narrative. Vicki Bertram, ‘Mimi Khalvati in Conversation’, PN Review, Vol. 26 No.2, November-December 1999.
 ed. John O. Hayden, William Wordsworth: Poems, Volume I, Harmondsworth: Penguin Books, 1977, 529. Marius Koceijowski, God’s zoo: artists, exiles, Londoners, Manchester: Carcanet, 2014, 276. Khalvati, The Meanest Flower, 21. Cite this: Fathi, Holly. 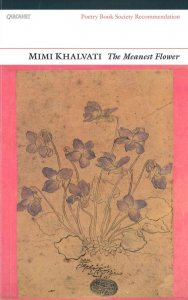 “The Presence of the Ghazal in The Meanest Flower (2007)” Postcolonial Writers Make Worlds, 2018, https://writersmakeworlds.com/essay-khalvati-meanest-flower/. Accessed 27 March 2019.